Your wedding is one of the most important events you'll ever plan, and the pressure to make it perfect is understandable. When you choose to have your wedding at the Maui Tropical Plantation, you don't have to worry about a thing. We handle everything, from the small details to the bigger issues, so all you need to do is sit back and enjoy your day! Photos courtesy of Maui Wedding Medias, BellaEva Photography and Natalie Brown Photography. If you're planning an intimate ceremony, the prized Garden Gazebo is the perfect backdrop for your wedding. With the lagoon sparkling in the background, this stunning location has been home to many breathtaking wedding pictures! This location can seat up to 100 guests. If your wedding party exceeds 100 people, there are plenty of other picture perfect locations on the property. From tucked away little garden coves to lavish ceremony set-ups, our coordinators will create a ceremony that will take your breath away. If your guest list is anywhere from 10-100 people, your private party is welcome to dine in the gazebo area. From champagne to a customized menu that will blow the socks off your guests, this reception will exceed your every dream! Maui is so lusciously green because of our sometimes surprise rain showers. If you don't want to worry about the weather but would still like to enjoy the lush landscape, one of our luxury tents is the perfect set up for you. Seating 200 or more guests, your celebration will be set no matter what the weather holds. Customize your banquet menu to suit your celebration needs, matching the artistic flair of executive Chef Jeff Scheer with your preferences. As you gaze out at the splendid view of the Waikapu Valley and rolling hills, you'll realize there is no better place to have a reception. If you're looking for a classic reception, this banquet hall has it all. With windows wrapping around the room, the view of the tropical gardens makes this reception dreamy. Your party can range anywhere from 50-200+ guests and you will get exclusive use of the banquet room for up to 4 hours. Surrounded by plumeria trees and birds of paradise, your floral budget will be next to nothing on the lavish lagoon terrace or central lawn. With the full service wedding planning that will coordinate and customize every detail for your wedding in paradise. This location works well with 50-200+ guests. If you're looking for a once-in-a-lifetime event, the breathtaking Mill House Restaurant will take your breath away. From the hand-carved stone floor to the million dollar view from the open air patio, this location was built to impress. Using the freshest, just-picked ingredients and the highest quality local produce, your meal may end up being the highlight of everyone's evening! The lighting is dreamily romantic, the location is jaw-dropping and the customized menu will take your guests on a culinary adventure. This location can seat up to 200 guests. With a reception at the popular Chef's Table, you'll end up getting entertainment in addition to the mouth-watering 7 courses that are served. 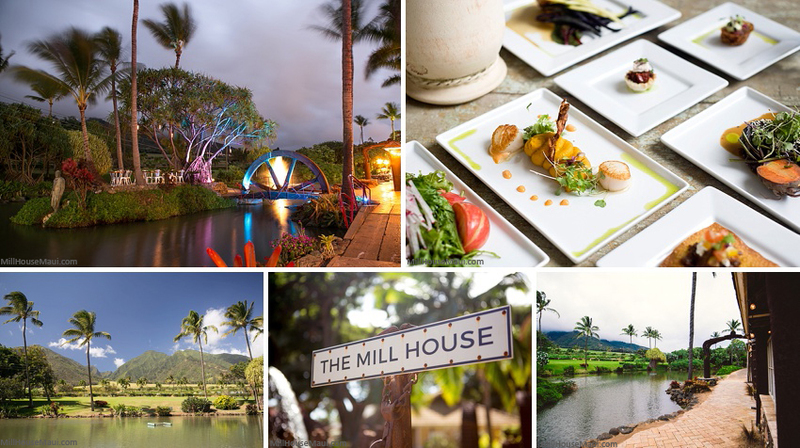 Chef Jeff Scheer, the executive chef of the Mill House Restaurant, has created a 5-star event that is taking the island by storm. This intimate experience starts with the open air kitchen and dining room, designed to invite each guest into the kitchen as the chef prepares each of the 7 courses. Every dish is prepared with the freshest ingredients and plated in the most deliciously artistic fashion. You can also choose to pair your culinary journey with a few of their cocktails, each made the freshest ingredients like plumeria flower syrup and surinam cherry jam. 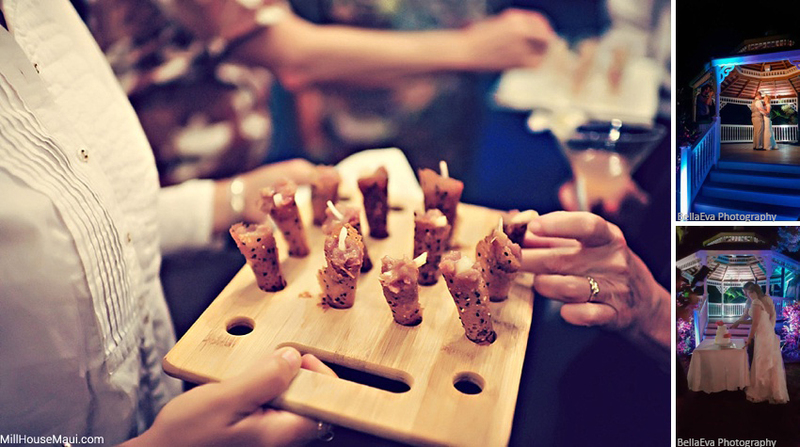 If you're looking for more than just a dinner reception, this option will exceed your every expectation! This cozy location is for a guest list that doesn't exceed 38 people. The Mill House "Field of Dreams"
Planning on inviting everyone you've ever met? The "Field of Dreams" is meant for parties with a minimum guest count of 300 people, and can handle upwards of 5,000 people. 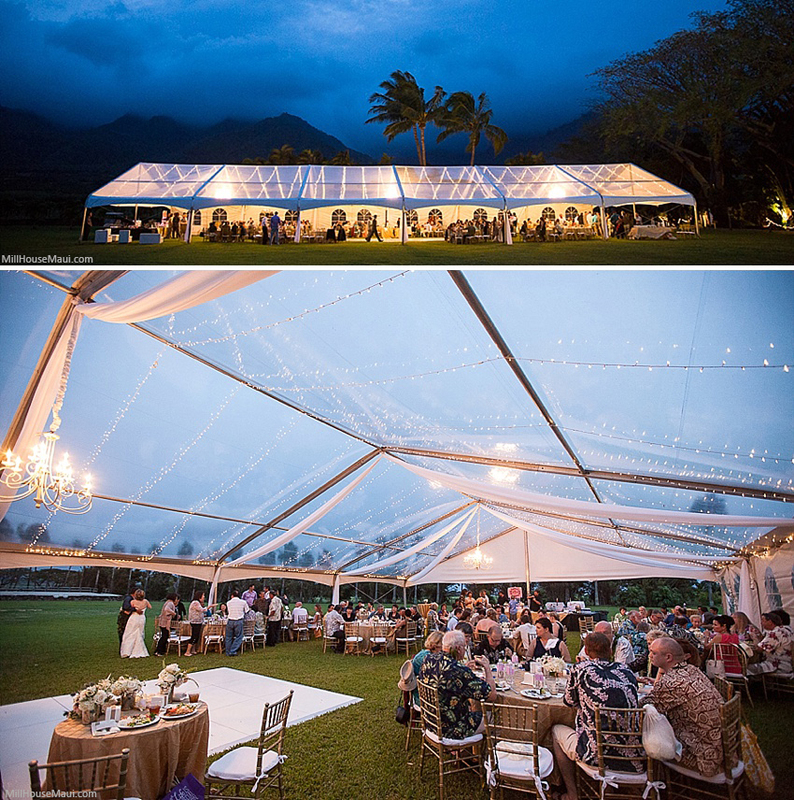 A wedding this big may feel overwhelming to you, but our experts at the Maui Tropical Plantation are used to planning high-profile events for large parties. And our ability to make every guest feel personally taken care of is just one of the many magic tricks we have up our sleeve. Your reception will still include all the artistic flair from the customized menu, the intimacy of celebrating your wedding and a seriously good time for everyone invited! Get ready to make all your dream come true! What's your favorite type of wedding venue? Comment below!